Home » Embedded Computing Design » With wireless sensors, "you've got (a lot more than) mail"
Welcome to the age of the Bluetooth connected embedded application. On one hand, right now manufacturers of the gazillions of “embedded” products are contemplating – if not already well on their way to launching – ways to connect their products to our smartphones and tablets using a Bluetooth Low Energy (aka: Bluetooth Smart) connection. Thought being, if consumers have the right app installed, our handheld devices will effectively be transformed into walking control panels for all the electronic stuff around us at home, at work, and out in the world at large. Want to turn your washing machine on without ever leaving your chair downstairs? Great: Fire up the app and hit “start.” Want to troubleshoot or execute a software upgrade on a nearby office printer or other machine in your workplace without opening up panels and getting your hands dirty? No problem: Open the app and make it so. On the other hand, our phones and tablets will begin to passively receive data from all manner of wirelessly connected “sensors” and “sensor networks” that will surround us in the future. Some of this data be distantly derived, arriving over our cellular network (not unlike our friends’ texts, SnapChats, and Vines) based on websites we’ve browsed, physical places that we frequent, and other trackable habits. Others will arrive from sensors that are, quite literally, within mere feet of us, delivered to our phones just because we happened to walk within range. (The emergence of iBeacons is a good example of this theory quickly moving into practice.) And still others will literally be “on” our persons, as is already happening with fast-emerging Quantified Self (QS) applications that can alert us to everything from the miles we’ve walked, the beats our heart has managed in the last hour, and the number of times we’ve spooned food into our mouths. Hence the myriad and new sorts of “You’ve got …”s mentioned earlier: In short, our mobile devices will soon transform us into walking magnets (or receivers, or sponges … pick your metaphor) for gazillions of new sensor readings, data packets, and other goodies soon that will be crowding the ether around us. How do you leverage this “embedded mobile connectivity” as a maker of products? The magic is comprised of three elements. First, your product’s embedded application will need a tiny radio of some kind added so that it can send or receive the data packets in question to the embedded application. (If the packets will be small, then a low-power radio powered by a battery or even an energy-harvesting power supply will be just the ticket; whereas a hardwire power supply will be required if you’re streaming video or audio or sending huge files over the air.) Whether you’re a large OEM with RF resources enough to develop your own discrete solution or a smaller manufacturer interested in slapping a pre-certified radio module (like Anaren’s AIR module, see below) down on your board, your radio will have to communicate using a reliable communications protocol such as Bluetooth. 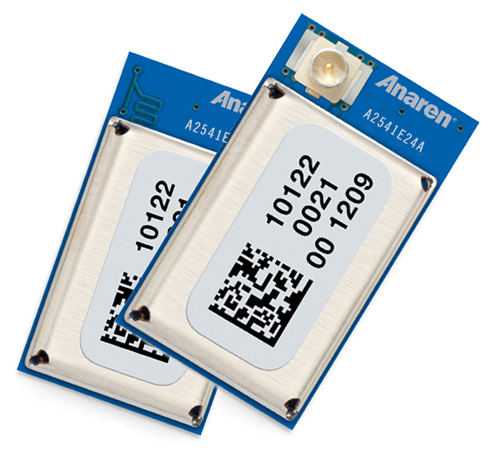 Anaren Integrated Radio (AIR) modules, now available with Bluetooth Smart technology, enable manufacturers to easily add wireless functionality to their embedded applications – including sensors and sensor networks. Once deployed, these newly connected embedded applications will be able to communicate with millions of Bluetooth SMART enabled smartphones and tablets via an app developed for that purpose. With your choice of a radio and protocol addressed, you’ll next need to form the RF connection between your embedded product and the mobile device, hopefully without having to mess about with your original embedded software code. Even with the benefit of a commonly accepted wireless protocol like Bluetooth, this can be tricky or require a good deal of Bluetooth stack expertise – so employing a shortcut like the “schema” approach developed by Anaren’s software ally, Austin, TX-based Emmoco, can vastly simplify and speed up this step. Finally, once received by the end-device, the transmitted data from your embedded product will need to be viewed or accessed by the user on the smartphone or tablet. This requires the development of a user interface or “app” very much like those we’re all using in our lives every day. In developing your app, all the usual questions that swirl around developing a user interface/consumer experience come into play: Do you want a simple window to open on the phone and show data packets arriving? Do you want the data to synch to the cloud for analysis or archiving purposes? Will you provide a branded user experience, where the “app” constantly communicates with and adds value for the customer? The good news here is there are literally thousands of app development entities you can engage to help you convert your data to something your end users, field techs, and other users can see and interact with. 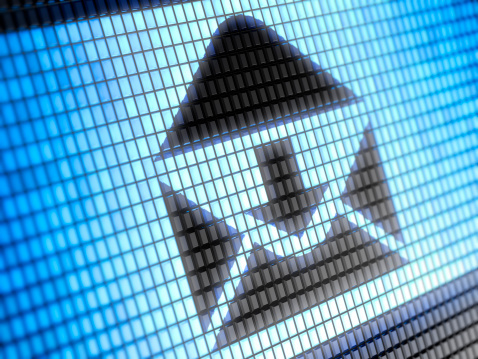 No matter what that data may be, the post-“you’ve got mail” era will be exciting.